When the iPhone 7 debuted last month, people weren’t exactly endeared to its sleek, headphone jack-less design. To compensate for the injustice brought on by the Airpod headphones (on sale now) -- and the haphazard rollout of iOS 10 -- people have developed their own iPhone 7 solutions, inventing hardware in the form of headphone adaptors and some pretty ingenious phone cases. While those remedies were certainly novel, a new case called the Smartkase might completely eclipse them. Boasting 10 hours of extra battery life, in addition to dual sim and memory card capabilities, the Smartkase is controlled through an app, integrating all of your phone’s media in a pretty seamless manner. It’ll expand your memory by 256Gb, so if you’re a workaholic -- or the kind of person who plays games to a nauseating degree -- your phone’s probably never been so useful. You can also charge your phone and case simultaneously -- a coup for anyone tethered to their device, to be sure. The whole thing was financed through a Kickstarter, and will hit the market by December, just in time for the holiday season. 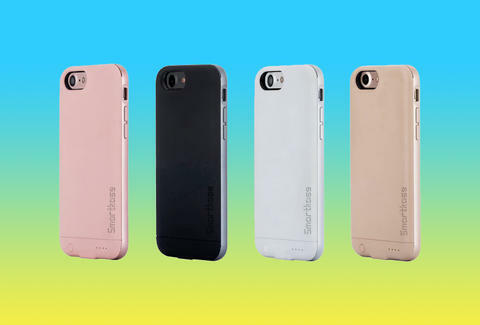 What’s more, it’s also cheap -- the Smartkase only costs $70 for all varieties of the iPhone 6, 6s and the standard iPhone 7. (A Smartkase for the iPhone 7 Plus and iPhone 6 Plus will cost you $99, because, you know, go big or go home). The glut of expanded iPhone products will probably wane sometime soon, so it might be appropriate to cash in before the holidays are over. But if you choose not to, just remember that drilling a hole in your iPhone 7 will not improve it in any capacity.